Highly invasive marine species in Whiting Harbor, near Sitka. ADF&G requests the public avoid Whiting Harbor, unless emergency. Visit the Control section of the Response tab to find out what ADF&G has been up to. We partnered with the Smithsonian to investigate use of biocides to control Didemnum vexillum in Whiting Harbor. We learned that in small enclosures salt and chlorine are effective agents to remove tunicate colonies from treatment areas. Didemnum vexillum (D. vexillum) is a marine colonial tunicate. Tunicates, in general, are commonly referred to as ascidians or sea squirts. D. vexillum is known as “carpet tunicate” because of its growth pattern, or “glove leather tunicate” due to the fact that it feels like soft, wet leather. In Alaska, it is mostly referred to by its shortened scientific name, “D. vex”; an apt nickname since it reflects the vexing way the species has been observed taking over marine ecosystems when introduced to new environments. This colonial tunicate is an invasive fouling species with rapid growth and mat-forming capabilities that colonizes and dominates artificial and natural hard substrata. It occurs in a wide range of marine habitats worldwide with potential significant conservation and economic consequences through the alteration of marine habitats and impacts to mariculture and fisheries, especially shellfisheries. D. vexillum is difficult to identify correctly with the naked eye because it looks like other didemnids, some of which are native to coastal Alaska. It may be orange, pink, yellow, tan or cream in color. Its surface has visible veins with small pores. 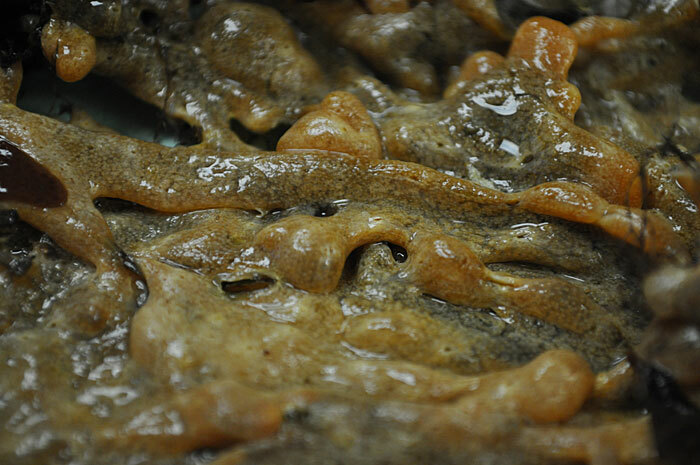 The texture of the sea squirt is smooth, like firm gelatin and leathery rather than slimy. The colony may cling strongly to the surface on which it grows and can be difficult to pull off nets, lines and other fibrous materials. Mature colonies can form large, pendulous lobes that resemble tendrils of dripping wax when growing on vertical substrate in the water column or in areas with low current velocity. When growing on the sea floor and in areas with high current velocity it forms low, undulating mats with short lobes. A colonial tunicate, D. vexillum colonies consist of many small individuals called zooids, each about a millimeter in length, sharing a common tunic or matrix. Zooids bodies are small, soft, and sac-like. Tunicates are filter feeders that survive by eating detritus and plankton-tiny animals and plants that drift in the ocean. Each zooid pumps water through its body, extracting food particles from the water and then, along with neighboring zooids, discharges the filtered water into a common space. The water leaves the colony from shared siphons. Siphons appear as small pores in the surface of the tunicate. The siphons are clearly visible on solitary tunicates, and sometimes expel water when gently squeezed, thus the name “sea squirt”. In the field, tunicates can be difficult to distinguish from sponges. Sponges tend to feel “spongy”- springing back when compressed, tunicates on the other hand resist compression. Rubbing a sponge animal between the fingertips feels gritty rather than slippery. Embedded within the thin layer of the tunic, though not clearly visible to the naked eye, are tiny, spiky balls comprised of calcium. The presence of these barbed balls can help differentiate between various colonial tunicates. Colonial ascidians are hermaphroditic- they are both male and female at the same time- and reproduce sexually by broadcast spawning, and asexually by budding. D. vexillum broods larvae in the colony’s matrix. The larvae spend a few hours moving within the water current before settling on a firm surface. The larvae metamorphose into zooids that can then start a new colony. Larval settlement happens at different times depending on a number of habitat parameters, such as water temperature. When lobes, sections of tunicate colonies, break off, they can drift in the water to a new site, resettle on hard substrate, and begin a new colony. Because it can grow rapidly when conditions are right, D. vex fouls and overgrows structures, benthic organisms and shellfish. Mariculture (marine aquatic farming) gear, docks, and buoys can be overgrown rapidly, requiring aquatic farmers to de-foul their gear more often to provide adequate filtration for shellfish growth, potentially effecting the mariculture industry. Natural environments, from intertidal and nearshore areas to offshore fishing grounds, have been infested with the carpet tunicates. Substantial impacts on marine food webs may result when invasive tunicates smother organisms living on the sea bottom, thereby concealing food from predators.